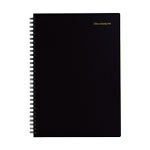 SKU: maruman-mnemosyne-no-197a-a6-ruled-notebook. Categories: Mnemosyne Japanese Notebooks, Mnemosyne Notebooks. 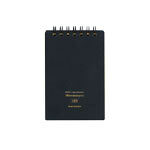 Often referred to as the Notebook Daily this A6 (5.8 x 4.5) spiral notebook has 80 leaves. Each page has top margin labeled as well as two columns near the left margin. Made in Japan of silky smooth paper.